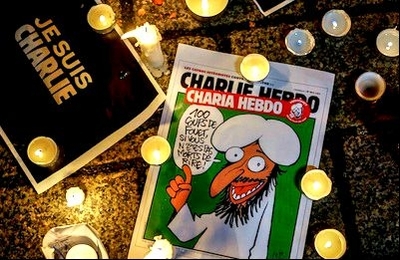 The deadly terror attack on a satirical magazine in Paris last week created a national mood of defiance that put Islamists on the defensive, while publicizing the offending cartoons of Muhammad even further. An epidemic of recent high-profile attacks by Muslims in the name of Islam – in Canada, Israel, Nigeria, Australia, Pakistan, and France – raises an obvious question: How do the Islamist perpetrators figure that murdering an honor guard, driving cars into pedestrians, slaughtering non-Muslim bus passengers, taking hostage the patrons of a café, or massacring army kids and cartoonists will achieve their goal of applying Islamic law and building a caliphate? Logically, their violence only helps if it terrorizes their enemies and compels them to bend to the Islamists' wishes; intimidation, after all, is the essence of terrorism. Sometimes, Islamist terrorism does achieve this objective. For example, to stay out of trouble, a sizeable number of artists have censored themselves concerning Islam; and the botched government response to the 2004 Madrid train bombings helped the opposition party win an election, then withdraw Spanish forces from Iraq. The 2013 Boston Marathon bombing locked down a large metropolitan area, giving millions a first-hand taste of Islamist oppression. Wednesday's killing of twelve in Paris created a national mood of defiance that put Islamists on the defensive as never before. If the first hours anticipate future developments, a significant portion of the French electorate will demand more effective measures against radical Islam. Instead of cowing a population, terrorism raises consciousness and provokes hatred for the Islamist cause among Muslims and non-Muslims alike. If high-profile violence is counterproductive, why do Islamists persist in this self-defeating behavior? Out of anger and because of a violent disposition. Anger: Islamists, especially the more extreme ones, exude bitterness, bile, resentment, and envy. They celebrate the medieval period, when Muslims were the richest, most advanced, and most powerful of peoples, and interpret Muslim decline as the result of Western duplicity and betrayal. Only by striking back righteously at these conniving Crusaders and Zionists can Muslims regain their rightful place of honor and power. Expressing anger becomes an end in itself, leading to myopia, an inability to plan, an absence of strategic thinking, and pulsating grandiosity. A violent disposition: Exulting in their sense of direct knowledge of God's will, Islamists favor violence. To make the enemy cower in fear, then smite him is the ultimate Islamist dream, a fulfillment of intense ill will, a triumph of Islam's superiority over other religions and those Muslims who lack the fire of their faith. Suicide bombings, beheadings, gangland-style murders, and other acts of grotesque recrimination express a deep desire for vengeance. Self-indulgence and strategic ineptitude are the hallmarks the Islamist campaign. In the long term, then, these acts of violence do immense damage to the Islamist cause. Turned around, the victims of that violence – some 10,000 fatalities in 2,800 attacks in 2013 alone – did not die in vain but unwittingly sacrificed their lives in a dreadful war of wills. Targeted assassinations, such as those against the French cartoonists, have an outsized impact on public opinion. In sum, self-indulgence and strategic ineptitude are the hallmarks the Islamist campaign. The catastrophe of the Islamist program is matched by the ineptitude of its tactics. And so, I conclude, its fate will be the same dust-heap of history where fascism and communism can be found. Like those two other totalitarianisms, it promises terrible destruction and many deaths before ultimately failing. The war will be long and painful but in the end, again, the forces of civilization will vanquish those of barbarism. The recent drumbeat of terrorism in the name of Islam may appear to help the Islamist cause. In fact, it brings its agenda closer to a deserved collapse.